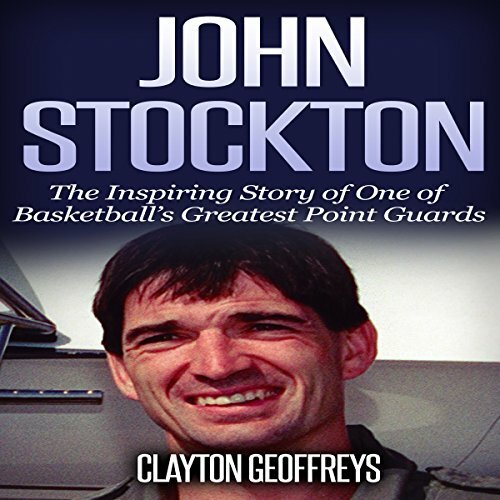 Learn the inspiring story of the Utah Jazz's legendary guard John Stockton! In John Stockton: The Inspiring Story of One of Basketball's Greatest Point Guards, you will learn the inspirational story of one of basketball's greatest point guards of all time, John Stockton. Stockton ran the point for the Utah Jazz through the majority of the '80s and '90s. He holds the NBA record for the most assists and steals of all time. Playing for the majority of his career alongside Karl Malone, Stockton had a highly illustrious career. By the time he retired, he was a 10-time All-Star and had led the league in assists nine times. He is one of few point guards to ever average a career double-double in points and assists. In this unauthorized biography, you'll relive Stockton's impressive career from his rookie season to his final game. First of all, I have to say how much I like the narrator. you might wonder how you make it through a sports book with stats and such, but when the narrator is easy to listen to, it makes all the difference. I jumped at the chance to listen to a book about the greatest point guard ever. I loved the stories, history, and background leading to the rise of John Stockton. if you're a fan, check this out. I learned some things, for sure. I wascvery disappointed in this book. I am not really sure whast i was looking for when iI started the book. But I did not like what I found. The first part ofbthe book was just a loop of how great John Stockton was. It was a list of all his accomplishments repeated several times. Then it went on to a game by game list of his stats. There were several phases that were repeated time and again without an explanation to what they meant. As someone that does not follow vasketball, I was a little confused. I did not make it through the hole book, but I listened to around 75% of it, but could not handle any more. I was given a copy of this book in exchange for a far review. I’m a huge fan of John Stockton. He was very underrated because of all the great players who played during the era. I enjoyed this quick and to the point story. The narrator did a great job of maintaining a good pace for the book. Success for many of us comes in different forms. Not everyone succeeded the same way, the other person does. This was shown in this unauthorized biography of John Stockton. I salute the author for a job well done. There is no formulae or the road map for success in general. Those considered great have a title. Stockton’s own success was not with title, but the author rightly put it and you cannot never see it and fail to notice it. In fact, it reminded me of the story of Jonathan and king David in the Bible, king Saul’s son. He was supposed to be the one enthroned as king after his dad, but chose to give up that right for David instead. This is what was displayed in Stockton’s story as shown by the author, because he used to supply balls for his teammates to score. A selfless act that made me to love the book and can recommend it. You want to be selfless, please choose to listen to this story. This is how the author of John Stockton’s story, displayed the basket ball player. Championships define the players careers. A talented shooting cannot win you a title. He was there to fill in the place of others. The new go-to guy in the midst. Are you one of this, please?